Hello there. I’m Kohana. 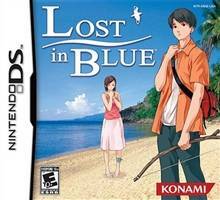 My kitty Trinkit suggested I give Lost in Blue for the Nintendo DS a try and since she’s always full of good suggestions I gave it a shot. She herself hasn’t had the chance to give it much of a shot so she bugged me to write an entry on it and here I am! Lost in Blue is a survival simulation taking place on a remote island. Your character, a boy named Keith, is shipwrecked and you must try and keep him alive. To complicate things very shortly in you run into Skye. Through a brief mishap her glasses end up broken which is why she won’t be doing much. To successfully play the game you must keep both characters alive which means finding food, keeping their thirst quenched, and ensuring they get enough rest all while trying to find a way back to civilization. If you don’t keep up their needs their health starts to drop and if it’s depleted for either character it’s game over. Since Skye can’t see well she won’t move much outside your sheltered area. To get her to go anywhere, including out to get a drink, you must hold her hands and take her. She’s not completely dead weight though, if you bring her food and spices she can cook you food which is more filling than if you had just eaten it raw, not to mention there are plenty of items which must be first cooked before you can eat them. At first most your time will be spent trying to find food as the basic stuff you find without tools isn’t very filling. Water thankfully isn’t too much of a major issue as there is a water source near your shelter. The only annoyance with water is that you need to take Skye out yourself to get her to drink or she’ll just dehydrate and start losing health. With some progress and exploration you’ll find certain items you can craft tools and upgrade your shelter. With new tools you’ll have an easier time getting filling food. And the shelter upgrades help you get better rest and more storage space. This frees up time so can get started working on the goal of the game exploring the island to hopefully find a way to get off and back to civilization. The game can get quite repetitive as you’ll spend a lot of time doing the same things over and over to get food. With an upgraded shelter you can store some but it is never enough to keep you covered for too long. Moving Skye around is annoying and slow as Keith needs to help her over ever jump, lift her up for every ledge, and similarly help her down ledges. The animations are quite cute at first however when you need to take her long distances they can become quite annoying. On the plus side the game makes great use of the Nintendo DSs features giving a nice tactile, and for the most part intuitive, feel to many of the activities. For instance you brush the stylus back and forth over the ground to brush away or dig up dirt/sand when looking in the ground or digging up potatoes or other vegetables in the ground. To shake a tree you move the stylus back and forth over the tree. For fishing you use it to tap where you want to throw your spear. All in all it is a pretty fun game. However this game is quite unique so it certainly appeals to a smaller niche of players. So if you have a friend who has it you probably want to try it out a bit before getting a copy for yourself. Thanks for reading! I’ll probably write again as Trinkit can be very demanding. If you thought normal cats were demanding you have no idea about the super intelligent game playing ones! Though the free tech support is nice… Anyway thanks again. I loved survival kids on the gbc, and i was very waiting for lost in blue. Lots of people were saying that this game is way too hard and repetitive. My opinion is that when you play a survival game , you have to survive with it. You cannot play Resident evil while listening to Ponchak. With Lost in blue , it’s the same. As an addition of trivias on this game, it’s fun to see that it was obviously named after the series Lost, while it’s called “survival kids ds” in japan.